This article is about the Western Christian practice. For Eastern Christian practice, see Nativity Fast. For other uses, see Advent (disambiguation). The Latin word adventus is the translation of the Greek word parousia, commonly used to refer to the Second Coming of Christ. For Christians, the season of Advent anticipates the coming of Christ from three different perspectives. Philip H. Pfatteicher, formerly a professor at East Stroudsberg University, notes that "since the time of Bernard of Clairvaux (d.1153), Christians have spoken of the three comings of Christ: in the flesh in Bethlehem, in our hearts daily, and in glory at the end of time". The season offers the opportunity to share in the ancient longing for the coming of the Messiah, and to be alert for his Second Coming. Advent is the beginning of the Western liturgical year. In the Roman Rite of the Catholic Church, the Western Rite of the Orthodox Church, and in the Anglican, Lutheran, Moravian, Presbyterian, and Methodist calendars, Advent commences on the fourth Sunday before Christmas—the Sunday nearest to St. Andrew's Day (30 November). It can fall on any date between 27 November and 3 December. When Christmas Day is a Monday, Advent Sunday will fall on its latest possible date. In the Ambrosian Rite and the Mozarabic Rite of the Catholic Church, Advent begins on the sixth Sunday before Christmas, the Sunday after St. Martin's Day (11 November). Practices associated with Advent include keeping an Advent calendar, lighting an Advent wreath, praying an Advent daily devotional, erecting a Christmas tree or a Chrismon tree, lighting a Christingle, as well as other ways of preparing for Christmas, such as setting up Christmas decorations, a custom that is sometimes done liturgically through a hanging of the greens ceremony. The equivalent of Advent in Eastern Christianity is called the Nativity Fast, but it differs in length and observances, and does not begin the liturgical church year as it does in the West. The Eastern Nativity Fast does not use the equivalent parousia in its preparatory services. It is not known when the period of preparation for Christmas that is now called Advent first began – it was certainly in existence from about 480 – and the novelty introduced by the Council of Tours of 567 was to order monks to fast every day in the month of December until Christmas. It is "impossible to claim with confidence a credible explanation of the origin of Advent". According to Saint Gregory of Tours the celebration of Advent began in the fifth century when the Bishop Perpetuus directed that starting with the feast of St. Martin, 11 November, until Christmas, one fasts three times per week; this is why Advent is also named Lent of St. Martin. This practice remained limited to the diocese of Tours until the sixth century. In the thirteenth century, the fast of Advent was not commonly practised although, according to Durand of Mende, fasting was still generally observed. As quoted in the bull of canonisation of St. Louis, the zeal with which he observed this fast was no longer a custom observed by Christians of great piety. It was then limited to the period from Saint Andrew until Christmas Day, since the solemnity of this apostle was more universal than that of St. Martin. When Pope Urban V ascended the papal seat in 1362, he simply forced people in his court to abstinence but there was no question of fasting. It was then customary in Rome to observe five weeks of Advent before Christmas. This is particularly discussed in the Sacramentary of St. Gregory. Ambrosian or Milan Liturgies have six. The Greeks show no more real consistency; Advent was an optional fast that some begin on 15 November, while others begin on 6 December or only a few days before Christmas. Since approximately the 13th century, the usual liturgical colour in Western Christianity for Advent has been violet; Pope Innocent III declared black to be the proper colour for Advent, though Durandus of Saint-Pourçain claims violet has preference over black. The violet or purple colour is often used for hangings around the church, the vestments of the clergy, and often also the tabernacle. In some Christian denominations, blue, a colour representing hope, is an alternative liturgical colour for Advent, a custom traced to the usage of the Church of Sweden (Lutheran) and the medieval Sarum Rite in England. In addition, the colour blue is also used in the Mozarabic Rite (Catholic and Anglican), which dates from the 8th century. This colour is often referred to as "Sarum blue". On the third Sunday of Advent, Gaudete Sunday, rose may be used instead, referencing the rose used on Laetare Sunday, the fourth Sunday of Lent. A rose coloured candle in Western Christianity is referenced as a sign of joy (Gaudete) lit on the third Sunday of Advent. During the Nativity Fast, red is used by Eastern Christianity, although gold is an alternative colour. Many churches also hold special musical events, such as Nine Lessons and Carols and singing of Handel's Messiah oratorio. Also, the Advent Prose, an antiphonal plainsong, may be sung. The "Late Advent Weekdays", 17–24 December, mark the singing of the Great Advent 'O antiphons'. These are the daily antiphons for the Magnificat at Vespers, or Evening Prayer (in the Roman Catholic and Lutheran churches) and Evensong in Anglican churches, and mark the forthcoming birth of the Messiah. They form the basis for each verse of the popular Advent hymn, "O come, O come, Emmanuel". German songs for Advent include "Es kommt ein Schiff, geladen" from the 15th century and "O Heiland, reiß die Himmel auf", published in 1622. Johann Sebastian Bach composed several cantatas for Advent in Weimar, from Nun komm, der Heiden Heiland, BWV 61, to Herz und Mund und Tat und Leben, BWV 147a, but only one more in Leipzig where he worked for the longest time, because there Advent was a silent time which allowed cantata music only on the first of the four Sundays. On the Third Sunday (Gaudete Sunday), the Gospel reading is again about John the Baptist, the other readings about the joy associated with the coming of the Saviour. The third Sunday, Gaudete Sunday after the first word of the introit (Philippians 4:4), is celebrated with rose-coloured vestments similar to Laetare Sunday at the middle point of Lent. The readings relate to John the Baptist, and the rose candle may be called that of joy or of the shepherds. In the Episcopal Church USA, the collect "Stir up" (the first words of the collect) may be read during this week, although before the 1979 revision of the Book of Common Prayer it was sometimes read in the first Sunday of Advent. Even earlier, 'Stir-up Sunday' was once jocularly associated with the stirring of the Christmas mincement, begun before Advent. The phrase "stir up" occurs at the start of the collect for the last Sunday before Advent in the 1662 Book of Common Prayer. ^ a b c d e f g Kennedy, Rodney Wallace; Hatch, Derek C (27 August 2013). Baptists at Work in Worship. Wipf and Stock Publishers. p. 147. ISBN 978-1-62189-843-6. There are a variety or worship practices that enable a congregation to celebrate Advent: lighting an advent wreath, a hanging of the greens service, a Chrismon tree, and an Advent devotional booklet. ^ perspective., Articles on moral / morality from Orthodox Christian. "Fr. Patrick Henry Reardon -- The Origins of Advent". orthodoxytoday.org. Retrieved 15 November 2017. ^ Company, Our Sunday Visitor Catholic Publishing. "Our Sunday Visitor Catholic Publishing Company > My Faith > Church Seasons and Feasts > Advent". osv.com. Retrieved 15 November 2017. ^ The Lutheran Witness. 80. Concordia Publishing House. 1961. ^ Michelin (10 October 2012). Germany Green Guide Michelin 2012–2013. Michelin. p. 73. ISBN 9782067182110. Advent – The four weeks before Christmas are celebrated by counting down the days with an advent calendar, hanging up Christmas decorations and lightning an additional candle every Sunday on the four-candle advent wreath. ^ a b Normark, Helena (1997). Modern Christmas. Graphic Garden. Christmas in Sweden starts with Advent, which is the await for the arrival of Jesus. 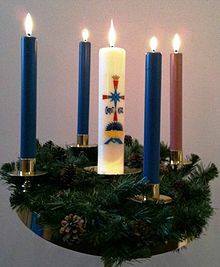 The symbol for it is the Advent candlestick with four candles in it, and we light one more candle for each of the four Sundays before Christmas. Most people start putting up the Christmas decorations on the first of Advent. ^ Rice, Howard L.; Huffstutler, James C. (1 January 2001). Reformed Worship. Westminster John Knox Press. p. 197. ISBN 978-0-664-50147-1. Another popular activity is the "Hanging of the Greens," a service in which the sanctuary is decorated for Christmas. ^ "Four Reasons It's Not 'Advent.'". Kevin (Basil) Fritts. Retrieved 29 September 2014. ^ Bingham, Joseph (1726). The Antiquities of the Christian Church. Robert Knaplock. p. 357. Retrieved 20 December 2014. ^ Tours. ), Gregory (st, bp of (1836). Histoire ecclésiastique des Francs, revue et collationnée et tr. par mm. J. Guadet et Taranne (in French). ^ "L'AVENT prépare NOEL – Le développement historique" [Advent prepares for Christmas – Historical development]. infocatho.cef.fr (in French). Retrieved 15 November 2017. ^ Origines et raison de la liturgie catholique, 1842 – Published in La France pittoresque, 2012. ^ The Oxford Dictionary of the Christian Church [Ed. F.L.Cross, 2nd ed., O.U.P., 1974]" p. 19. ^ "The Season of Advent – Anticipation and Hope". CRI/Voice, Institute. Archived from the original on 2 February 2010. Retrieved 14 December 2009. ^ "Blue Liturgical Vestments". ewtn.com. Retrieved 21 November 2017. ^ "CATHOLIC ENCYCLOPEDIA: Gaudete Sunday". newadvent.org. Retrieved 10 December 2016. ^ "Liturgical Vestment Colors of the Orthodox Church". Aggreen. Archived from the original on 8 December 2009. Retrieved 14 December 2009. ^ "Clement A. Miles, Christmas Customs and Traditions (Courier Corporation 1912), p. 91". Books.google.com. 2017-11-18. Retrieved 2019-01-14. ^ "Saint Martin's Lent". Encyclopædia Britannica. Retrieved 4 December 2013. ^ "Terminanmeldung – Meditation und Gestaltung eines Adventslabyrinths (=Appointment – Meditation and design of an Advent labyrinth)" (in German). Heilig Kreuz – Zentrum für christliche Meditation und Spiritualität. 2016. Archived from the original on 23 December 2016. Retrieved 23 December 2016. ^ Stefanie Matulla (11 December 2016). "Das "Türchen" zum 3. Advent (=The "door" to the 3rd Advent)" (in German). Referat für Mädchen- und Frauenarbeit des Bistums Limburg (=Department for Girls' and Women's Work of the Diocese of Limburg). Retrieved 24 December 2016. ^ Colbert, Teddy (1996). The Living Wreath. Gibbs Smith. ISBN 978-0-87905-700-8. It is believed that the European advent wreath began as a Lutheran innovation in the sixteenth century. ^ Mosteller, Angie (2010-05-15). Christmas, Celebrating the Christian History of Classic Symbols, Songs and Stories. Holiday Classics Publishing. p. 167. ISBN 0-9845649-0-X. The first clear association with Advent is generally attributed to German Lutherans in the 16th century. However, another three centuries would pass before the modern Advent wreath took shape. Specifically, a German theologian and educator by the name of Johann Hinrich Wichern (1808–1881) is credited with the idea of lighting an increasing number of candles as Christmas approached. ^ "Johann Hinrich Wichern – Der Erfinder des Adventskranzes" (in German). medienwerkstatt-online.de/. Retrieved 11 December 2017. ^ (in French) "How to prepare an Advent Wreath" (in French). Retrieved 29 October 2017. ^ a b c "Felix Just, "Resources for Liturgy and Prayer for the Seasons of Advent and Christmas"". Catholic-resources.org. 2018-05-04. Retrieved 2019-01-14. ^ "Božić u Hrvata" [Christmas in Croatia]. hic.hr (in Croatian). Retrieved 29 October 2017. ^ Oxford English Dictionary. Second edition, 1989 (first published in New English Dictionary, 1917). In the Roman Catholic Church since 1969, and in most Anglican churches since at least 2000, the final Sunday of the liturgical year before Advent is celebrated as the Feast of Christ the King. This feast is now also widely observed in many Protestant churches, sometimes as the Reign of Christ. ^ "Advent Themes". Our Daily Bread. December 2011. Retrieved 10 December 2017. ^ a b Hoffman, Jan Luben (September 1993). "Circle of Light: Four themes for use with the Advent wreath". Reformed Worship. Retrieved 10 December 2017. ^ Tullos, Matt (1 December 2017). "Advent Devotional (Week 1): Faith". lifeway.com. Archived from the original on 25 January 2016. Retrieved 10 December 2017.